At the Ryukyu Shimpo Office, on July 22, Hsu Guang-hui, professor at Taiwan Police College (right in the foreground), a representative of the founders of the Association, calls for fund-raising to help erect the Ryukyu Uminchu Statue. Since about 1905 Okinawan fishermen had a presence in Keelung, Taiwan, where they formed a community known as the “Ryukyu village.” They actively interacted with the locals and it is said that they taught local fishermen their methods of catching marlin. Elderly residents still remember their feelings of gratitude towards the Okinawan fishermen. On July 22, Hsu Guang-hui, professor at Taiwan Police College and a representative of the founders of the association to erect the Uminchu statue, visited the Ryukyu Shimpo Office with his colleagues to introduce the association’s activities. 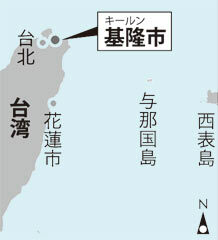 According to Hsu Guang-hui, many fishermen moved from Okinawa during Japan’s period of colonial rule over Taiwan following the Sino-Japanese War that ended in 1895, and it said that there were more than 500 Okinawan people living there in around 1921. As many as 3000 graves that have no one to tend them can be found in Wan Shan Gung and it is said that most of those people were from Okinawa. One elderly gentleman said, “In those days, Okinawan fishermen helped Keelung to flourish. We had a good relationship.” Local residents still provide the incense and flowers at the temple for the long deceased fishermen. Telephone inquiries should be directed to 098 (860) 5218.